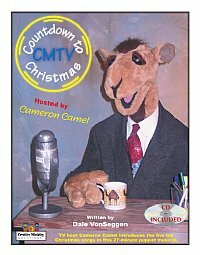 This fun Christmas musical stars Cameron, a crazy camel DJ coming to you on CMTV in the Middle East. It is 27 minutes long. His witty newscasts, weather report, and sports highlights are interspersed with his presentation of the top five Christmas songs. You'll also hear humorous commercials that you'll enjoy staging. There are four characters and an announcer voice. Includes pre-recorded musical on CD, with printed script, song lyrics, and production tips.